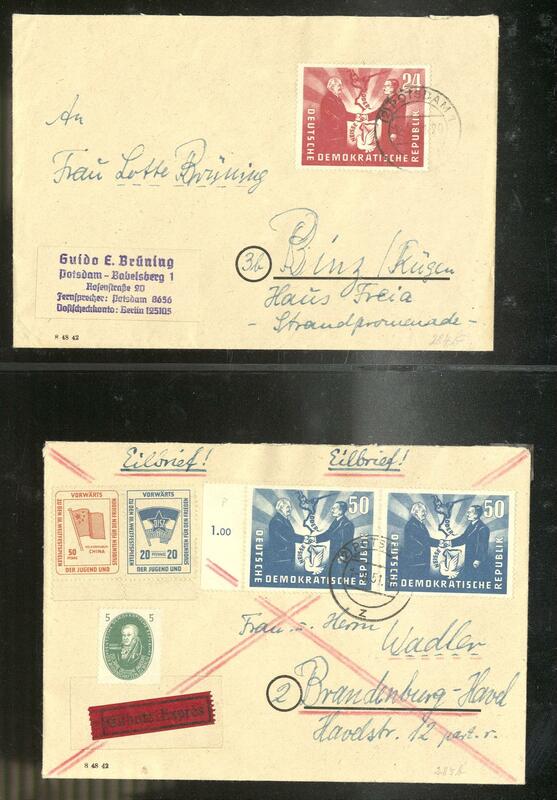 273 ⊙ German Demokratic Republik (East Germany) - 1949 / 90, nice used collection housed in four ring binders, in the number of a major listing complete with all issued stamps including academy 1950, DEBRIA-souvenir sheet, German Chinese friendship, heads set with German Demokratic Republik (East Germany) watermark, all four Marx souvenir sheet with special cancellations and so on. A magnificent object! Michel approximate 4700,- €. 280 German Demokratic Republik (East Germany) - 1949 / 90, very nice mint never hinged collection, in the number of a major listing complete in five beautiful black safe binary hingeless printed form ring binder including the good first issues like academy 1950, German Chinese friendship, heads set with German Demokratic Republik (East Germany) watermark, all four Marx souvenir sheet, Five Year plan series and so on. A magnificent object! Michel approximate 5500,- €and original price the albums approximate 700,- €. 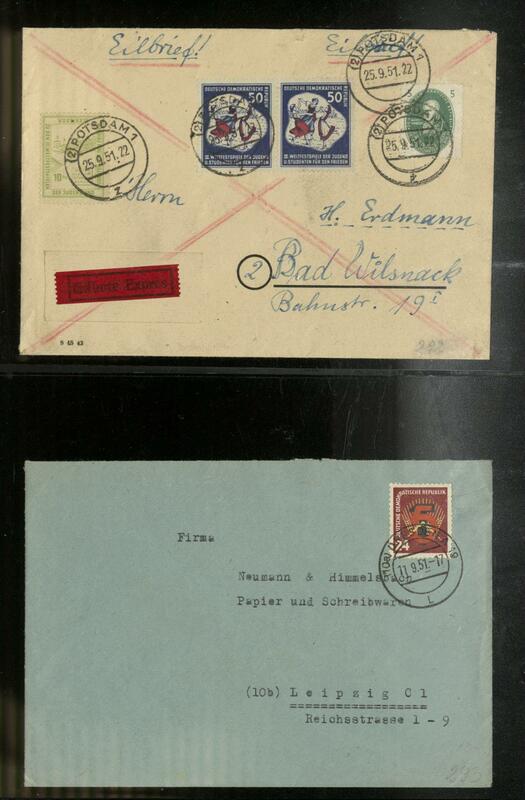 327 ✉ German Demokratic Republik (East Germany) - nice and extensive inventory from approximate 700 covers and First Day Cover with decorative documents, blocked value series, souvenir sheets, beautiful subjects and so on. Favorable! 338 / German Demokratic Republik (East Germany) - 1949 / 72, complete collection with all issued stamps in the Lighthouse spring back binder, in the number of a major listing complete including academy 1950, DEBRIA-souvenir sheet, German Chinese friendship, all Marx souvenir sheet, five year plan sets, heads set with German Demokratic Republik (East Germany) watermark and so on. Favorable! 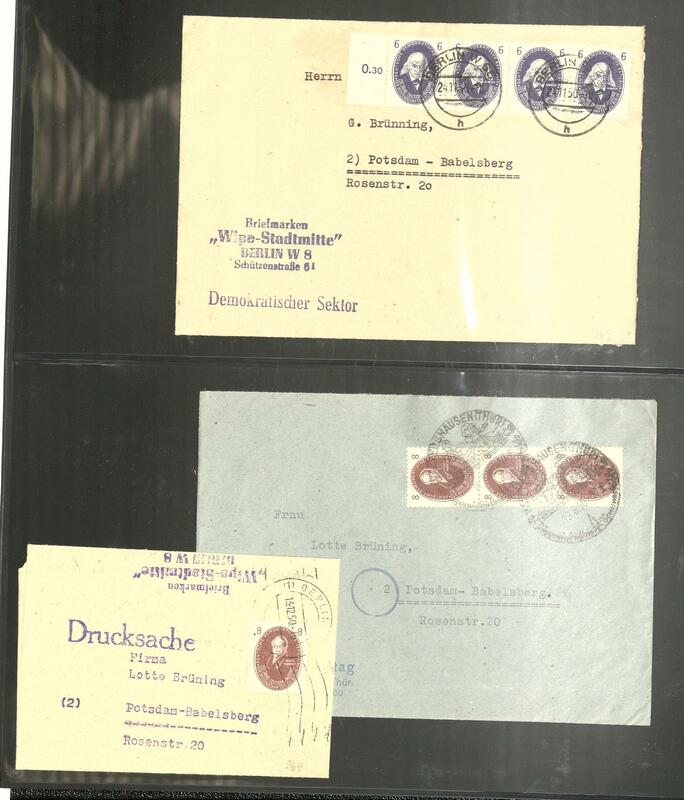 345 x German Demokratic Republik (East Germany) / service - interesting lot the official stamps and ZKD values in the ring binder, a small stockbook, as well mounted on pages. 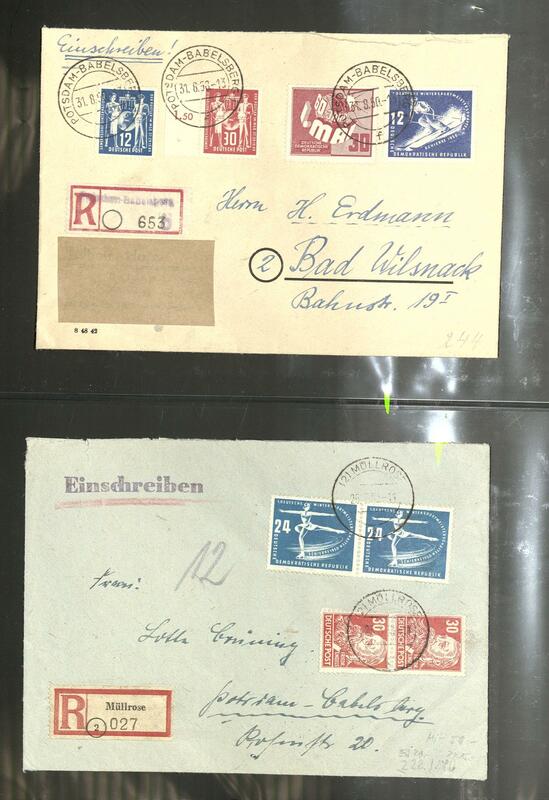 As well numerous mint never hinged issues, as well also used values and so on. 392 /⊙ German Demokratic Republik (East Germany) - extensive lot in a large thick stockbook accommodated, with also interesting plate flaw, sheet numbers, numerous mint never hinged corners of the sheet with many blocked value series and so on. A nice inventory! 395 /⊙ 405/22, Mi. 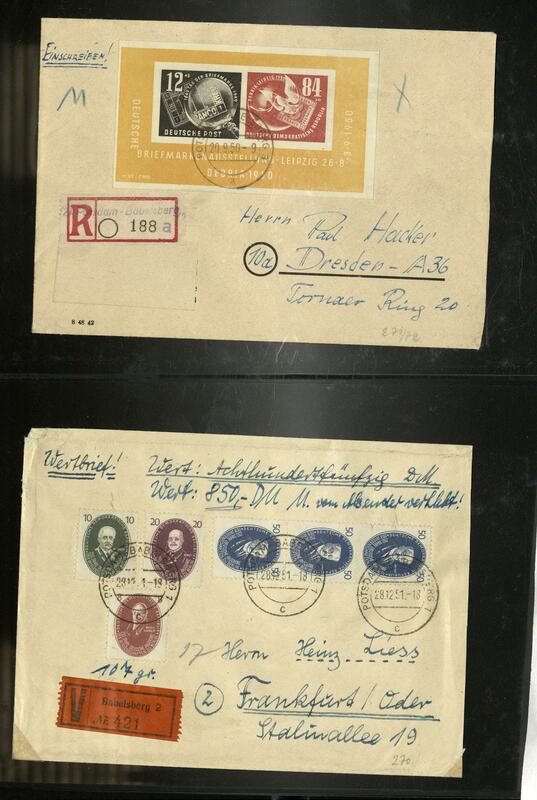 € German Demokratic Republik (East Germany) - 1949 / 56, clean lot, in stock created in a large stockbook, as well better issues of the early years, special- and Commemorative stamps, also heads values, five mint never hinged sets five year plan 1953 (Michel no. 405 / 22, Michel 1250,- €) and so on. Favorable! 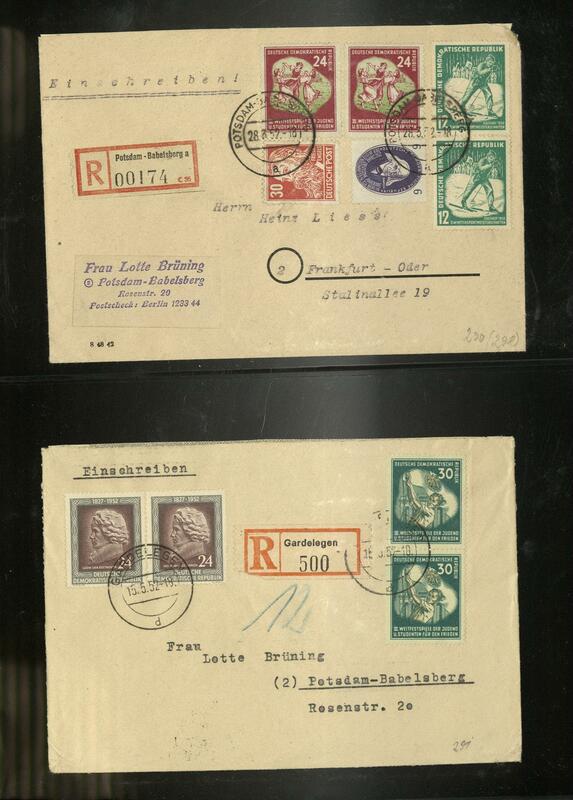 414 ⊙ German Demokratic Republik (East Germany) - stamps exhibition Magdeburg 1989, 31 complete sheet sets with gutters and centerpieces, in perfect condition with corresponding special cancellations. Michel 2850,- €. 424 German Demokratic Republik (East Germany) - stamps exhibition Magdeburg 1989, 26 complete sheet sets with gutters and centerpieces, unfolded, in perfect condition mint never hinged Michel 3250,- €. 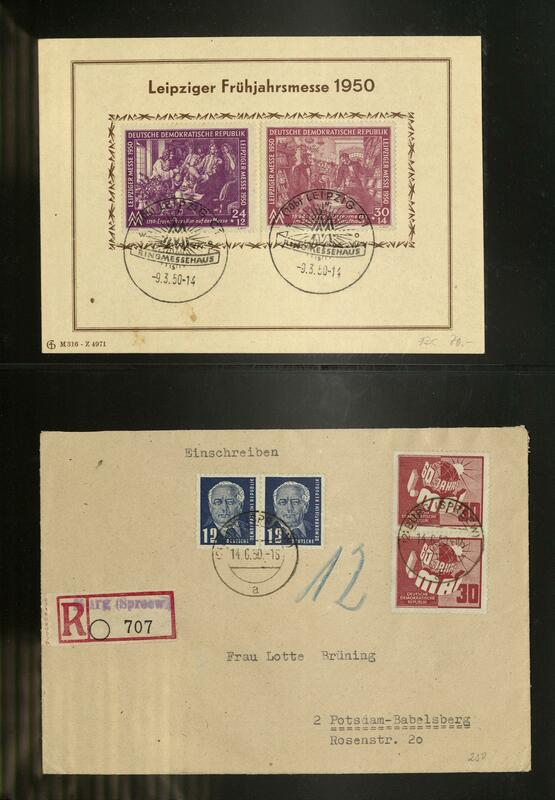 448 x German Demokratic Republik (East Germany) - extensive inventory from stamp booklet sheet and se-tenant, predominantly mint never hinged and packed in a carton, as well numerous various issues, huge catalogue value, very favorable! 453 year kF German Demokratic Republik (East Germany) - 1984 / 90, nice inventory from 37 yearbooks, of it 36 mint never hinged issues, partly still in original packaging. Enormous subscription price! Michel 4530,- €. 499 ⊙ German Demokratic Republik (East Germany) - 1949 / 90, nice used collection, in the number of a major listing complete in three Schaubek illustrated albums including all beginning valued as for instance academy 1950, German Chinese friendship, heads set with German Demokratic Republik (East Germany) watermark, DEBRIA-souvenir sheet on very nice registered decorative cover with special cancel, all fours Marx souvenir sheet and so on. 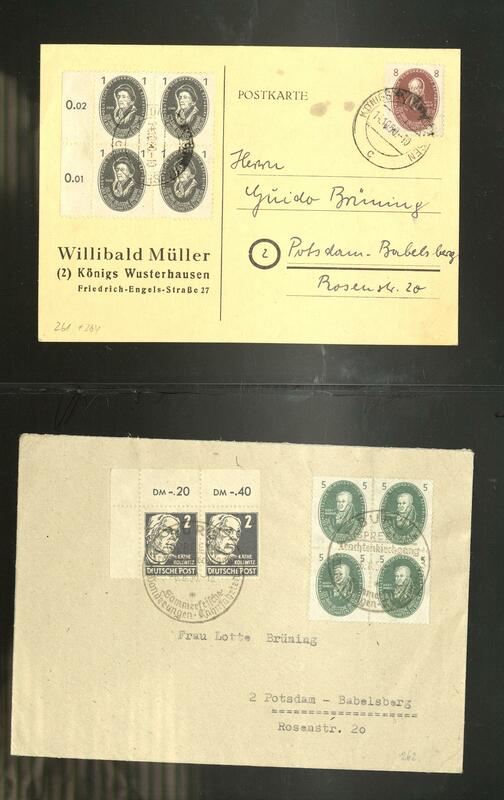 Additional are as well numerous official stamps included. A magnificent object! Michel approximate 4700,- €. 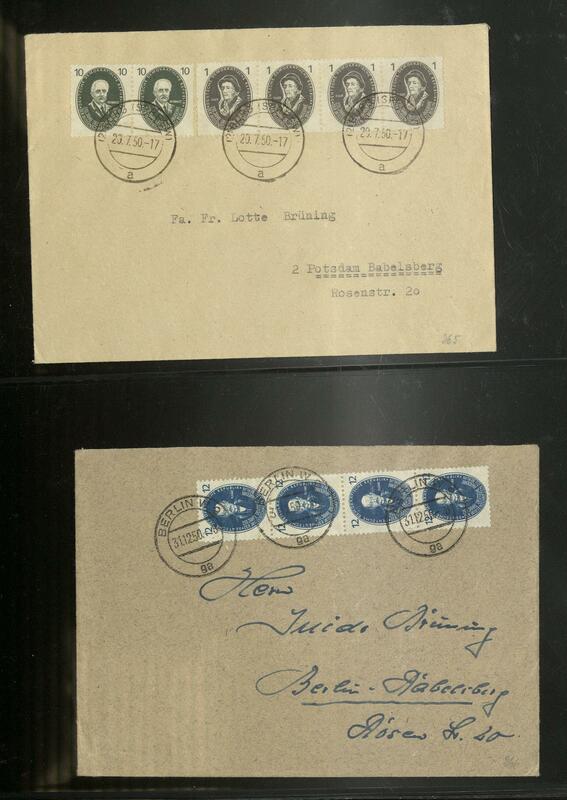 527 German Demokratic Republik (East Germany) - 1949 / 90, nice mint never hinged collection, in the number of a major listing complete in eight decorative self-designed Lindner ring binder. 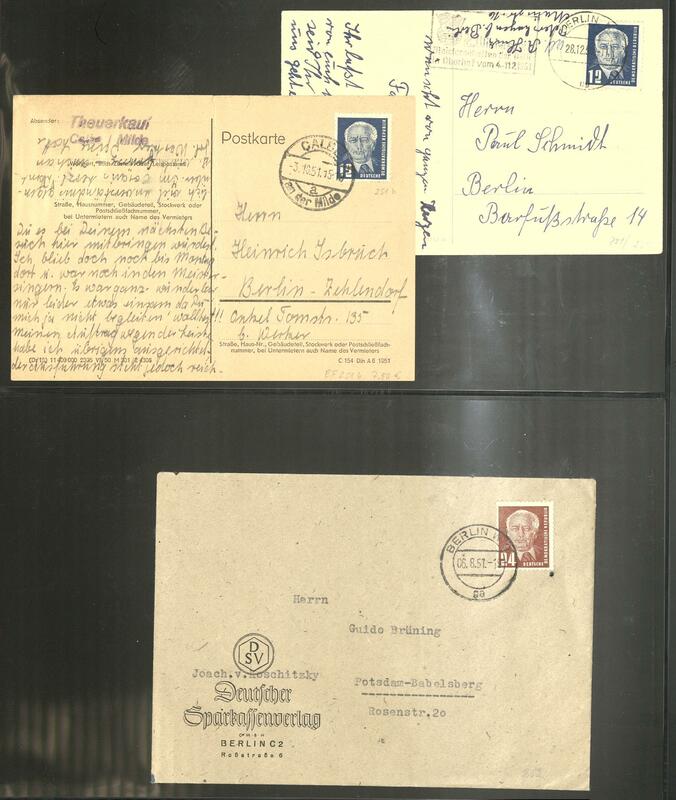 And, of course, all good first issues including academy 1950, German Chinese friendship, heads set with German Demokratic Republik (East Germany) watermark, five year plan sets, all fours Marx souvenir sheet and so on. Enormously original price the albums! Michel approximate 5500,- €. 528 ⊙ German Demokratic Republik (East Germany) - 1949 / 90, extensive used collection, except for the heads set in the number of a major listing complete in three Schaubek hingeless illustrated albums. And, of course, all good beginning valued including academy 1950, German Chinese friendship, all fours Marx souvenir sheet and so on. A superb collection! Michel approximate 4300,- €. 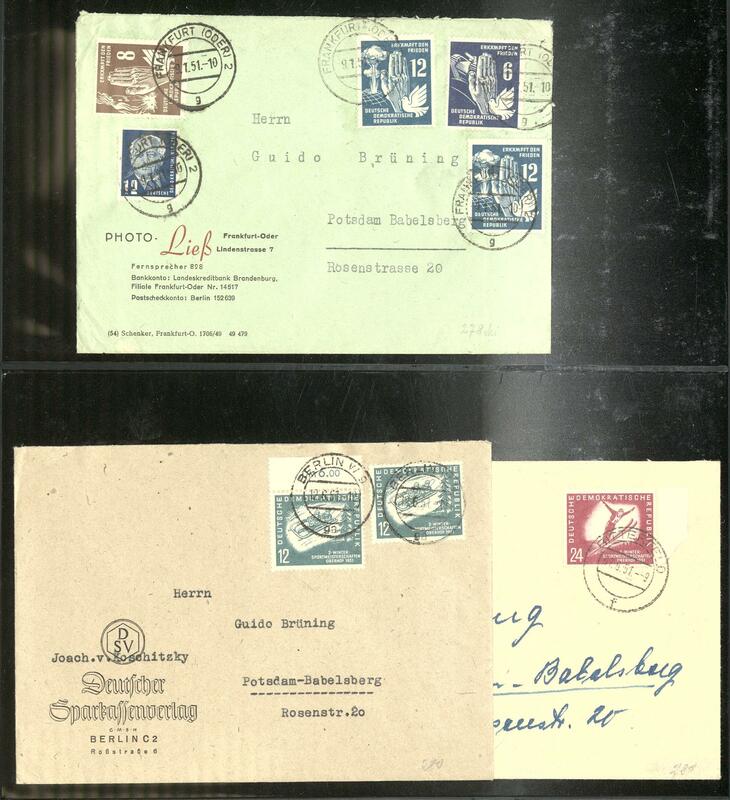 543 /⊙/ German Demokratic Republik (East Germany) - 1949 / 90, extensive inventory in three large stock books accommodated with lots of material, often stacked closely one above the other, an enormous amount of material including beginning valued, with also the DEBRIA-souvenir sheet unused with good plate flaw III, numerous blocked value sets and so on. Huge catalogue value! 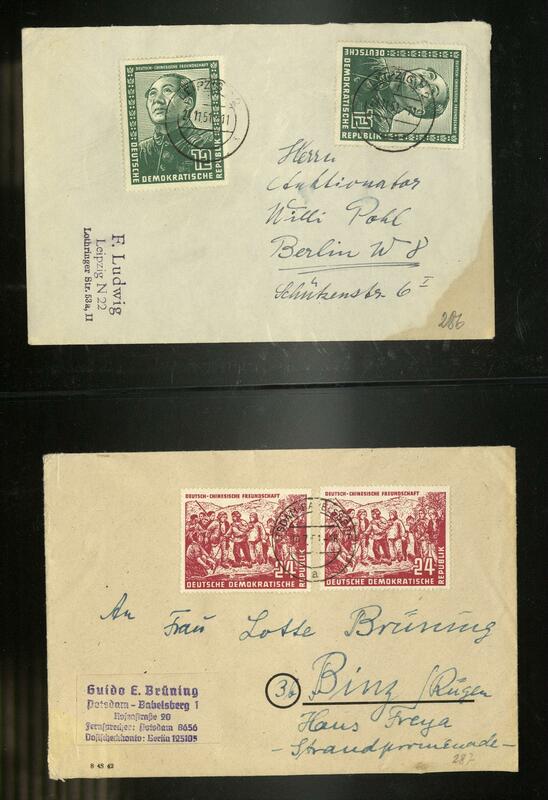 591 / German Demokratic Republik (East Germany) - 1949 / 90, extensive collection, in the number of a major listing complete in six beautiful claret Lindner ring binder formed. 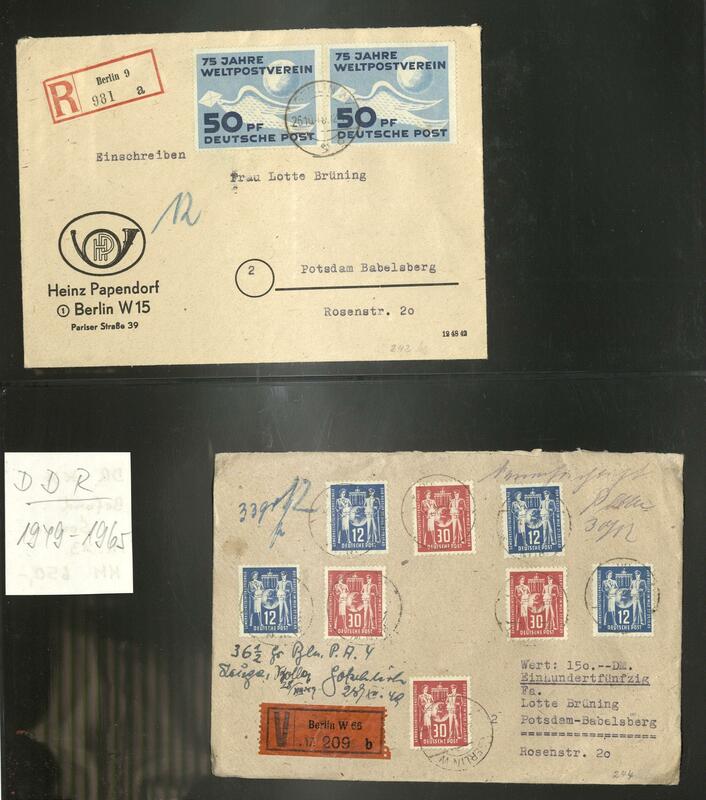 And, of course, all first issues including academy 1950, German Chinese friendship, heads set with German Demokratic Republik (East Germany) watermark, Marx souvenir sheet, Five Year plan series and so on. Favorable! 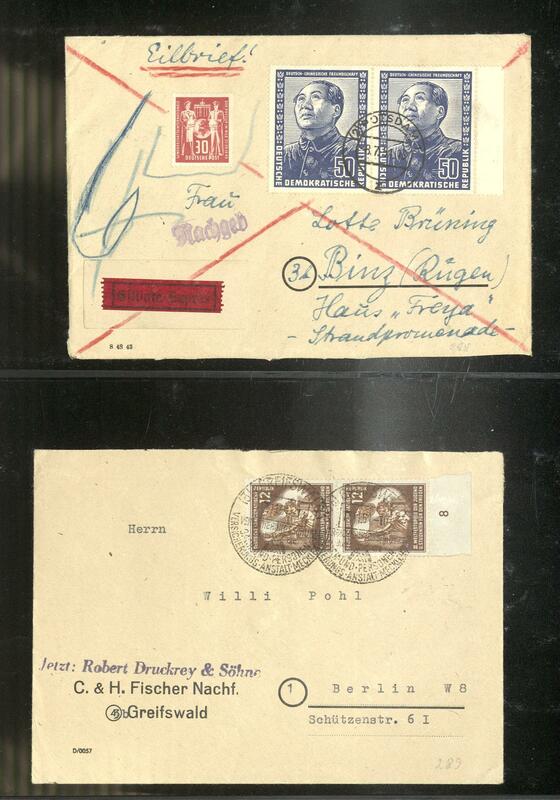 593 ⊙ German Demokratic Republik (East Germany) - 1949 / 90, nice used collection in three Lighthouse illustrated album, in the number of a major listing except for souvenir sheet 8 / 9 B complete with all good issues as for instance academy 1950, German Chinese friendship very fine centric cancellation, the perforated Marx souvenir sheet with special cancel, all further souvenir sheets, blocked value series and so on. 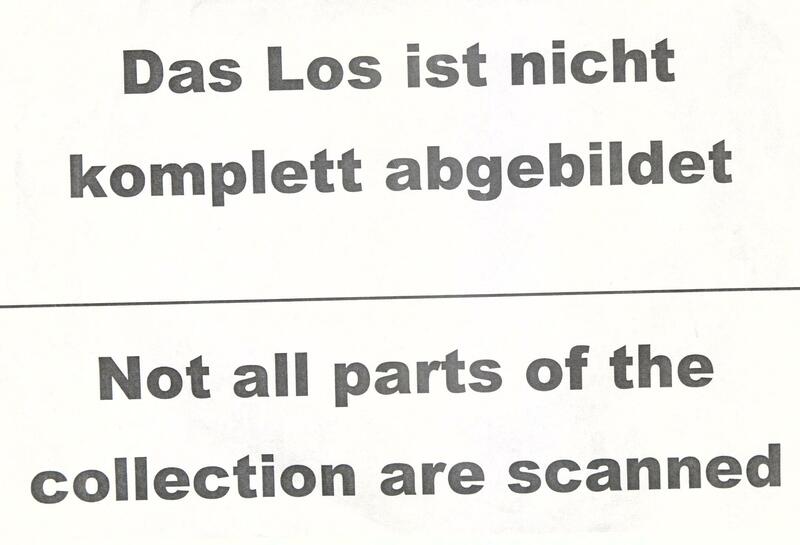 Also the good heads set with German Demokratic Republik (East Germany) watermark is neat cancelled available. Favorable opportunity! Michel approximate 4300,- €. 609 /⊙ German Demokratic Republik (East Germany) - extensive lot in four large stock books, as well lots of mint never hinged material, often stacked closely one above the other, numerous blocked value series, a large number souvenir sheets and so on. Enormous catalog value! 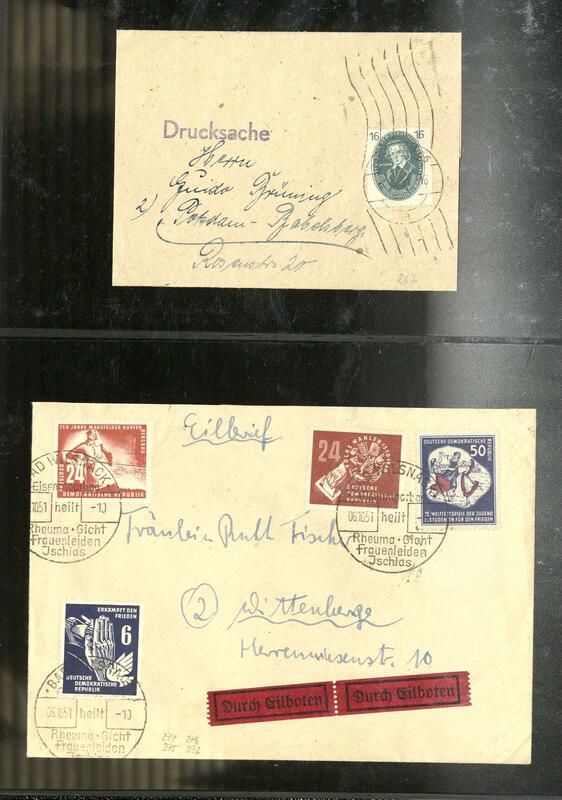 686 ✉ German Demokratic Republik (East Germany) - nice collection the postage stamps set \"German post\" from the year 1990 with interesting covers and cards in the ring binder, all single frankings with rarely use form, the 10 Pfg. 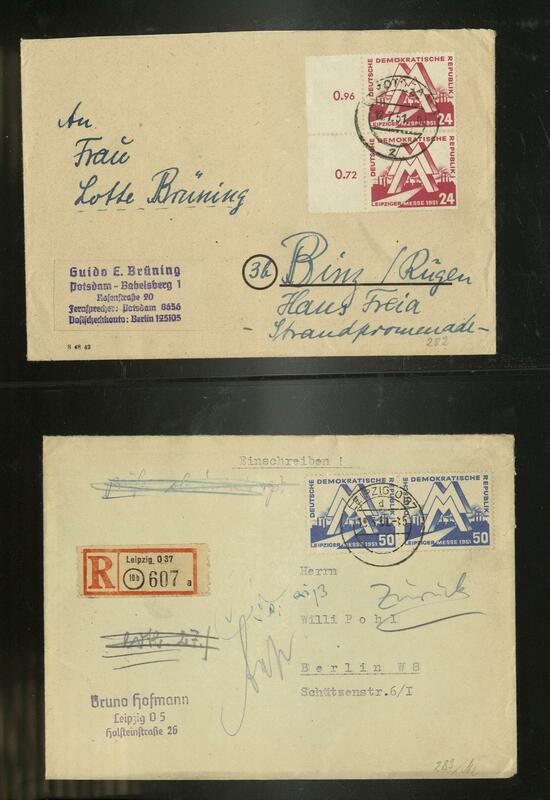 As correctly franked single franking on airmail post office mail letter to France, further documents to France, Spain, Russia, USA, Great Britain and Netherlands. An attractive object!